Replaces More Expensive "Name Brands"
Compare the Quality, Compare the Price! 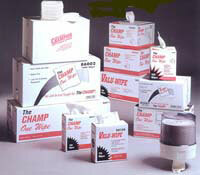 "The Champ" One Wipe: Soft and strong like cloth...perfect all-purpose wiper. Constructed of honeycomb pockets engineered to trap liquids. Wipes dry...no smearing or streaking! For use in automotive, utilities, manufacturing and production environments. Cleans grease, oil, water and solvents with just ONE WIPE! Available in quarter-fold, flat-pack dispensers, center pull rolls and convenient pop-up dispenser boxes. Champion Cellulose Wipers: Sturdy, convenient and highly economical...versatile enough for many different applications, airlaid bonded cellulous wipers are perhaps your best choice for value. 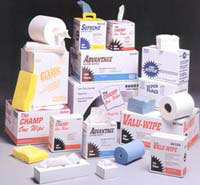 Replace a variety of wipes in laboratories, production areas and healthcare environments. Available in various different weights, sizes and case packs.